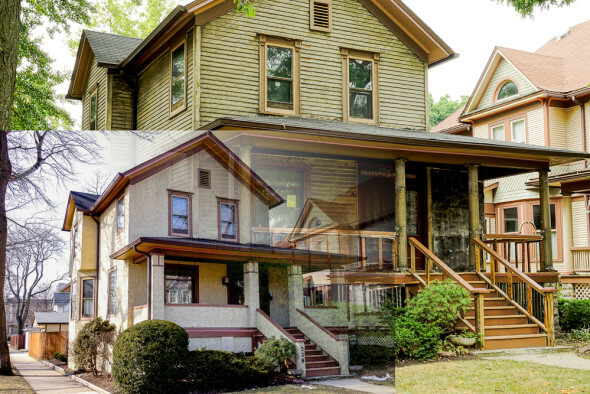 Living in an architecturally historic community, one will see renovation taking place everywhere. And what does the historic governing board of a historic village love to see?… Returning to original. 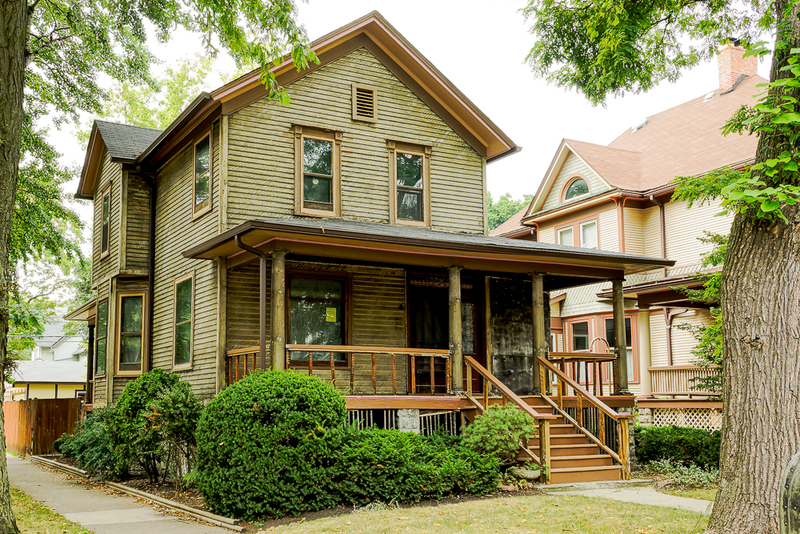 The 239 S. Grove, in Oak Park, was a beautiful CV (Charming Victorian) lovingly cared for by my friend and client, Susan and her husband. The exterior was stucco and you could tell that the stucco was most likely NOT the original siding. The interior was full of some of the most beautiful woodwork I have ever seen. There was no central air… no fancy kitchen… no new baths (it only had one!!! 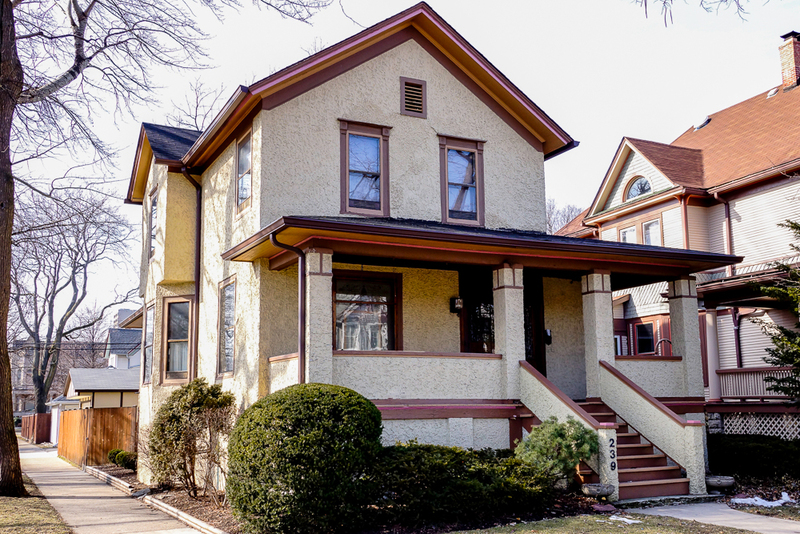 )… but the character inside this rather small Oak Park home was like no other I had seen in the past 15 years of residential real estate. Look at the house (above) after the stucco has been stripped off. The original clapboard (most likely cedar) appears to be in fantastic condition. Before tearing off an added covering on an old house like stucco or asphalt shingles, a contractor would tell you to to estimate needing to replace about 700-1000 linear ft. of the original cedar (for a house of this size). Take a close look at the far right side of the home’s front porch. (click on the photo for a larger image) See that black wall? That is not original to the house. That “addition” was done not long after the original build date of the home. It is actually built over what was originally that section of the front wrap-around porch. The very small addition was to provide for a large cedar coat closet on the inside of the house. Crazy, huh? In 2013 the home was purchased by a young couple and Susan moved closer to work in the city. And then, as I often drive by this area of Oak Park because my kids are in the middle-school near by… I started noticing something. 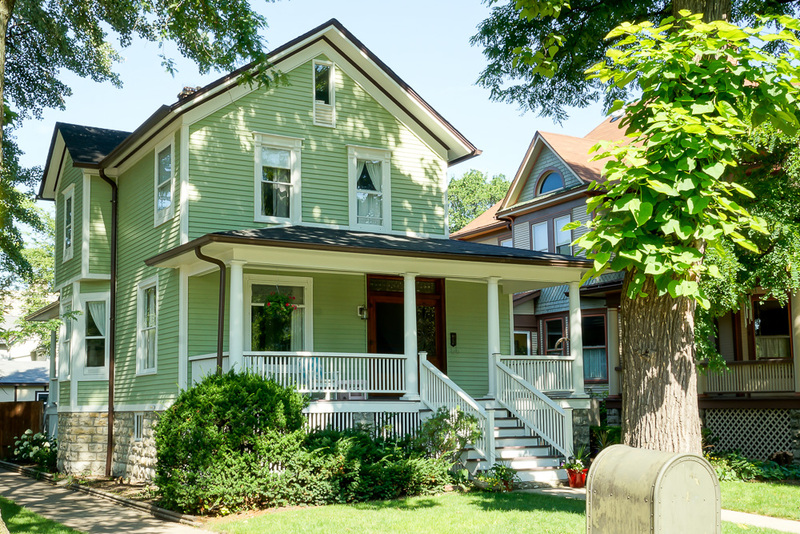 The CV was being transformed from a charming Victorian to a Victorian farmhouse reborn. The new owners painstakingly worked the home from one stage of restoration to another. And look what they did, Susan!!! Beautiful. 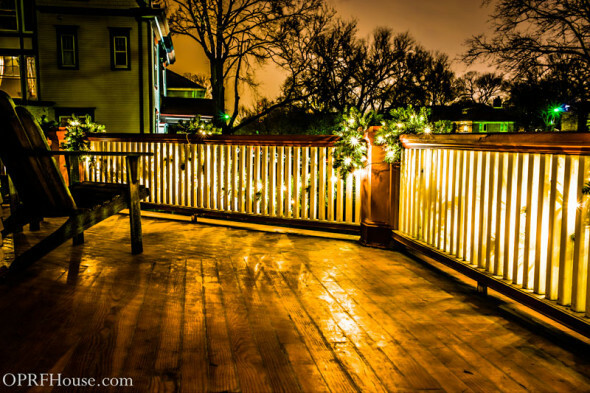 I have been using digital photography for real estate for the past 14 years… ever since I started with my first firm, Gagliardo Realty in River Forest. Back then… my Nikon Coolpix was something from the future and most agents didn’t even know what the heck that thing was! We didn’t have professionals go and shoot the house’s photos and most firms were still letting the multiple listing service take the photos for the then newly online listing service. You remember those photographs right?!?! The drive-by house photo where the kid in the car sticks out his huge digital camera… slows down to about 5mph and shoots?!?! Awesome. In those days the agent taking their own digital photography of their listings was really “stepping out of the box”. Today, most firms have professionals take their house photos before going live with the listing. I do as well. But in order to continue to differentiate myself from all the rest I need to step out of the box again. One of those steps is diving into HDR photography or High Dynamic Range imaging. Check out HowToGeek.com for a more thorough explanation but let me give you as simple an explanation here. OK? The digital sensor in our digital cameras is the thingy that captures whatever it is you are taking a picture of. Our eyes see all the detail of what we are looking at and we are often so amazed at what we see that we must get that photograph! But then we go and look at the picture and go… “Eh… it’s OK.” The photo may not always turn out how you remember you saw it. That is because the sensor thingy is limited in its range of capture. The sensor needs to find the happy medium between the deep detailed shadows and the bright white features of the subject we are shooting. This is what practically all of our cameras are doing… finding the happy medium. This is called Low Dynamic Range imaging… normal. HDR imaging, in a number of different formats, strives to capture the entire range of exposures into one brilliant photograph. The most common way we can do this is to take a number of photographs of the exact same subject and position using different exposures each time and “merge” them together using special software. The taking of the images will almost always require a tripod. Some fancy cameras, such as my Sony NEX-7, even have in camera HDR ability. The camera itself fires off 3-4 times the same shot and using its own on-board software merges the photos together to bring all the details together in one photograph. Cool, huh? I can tell you it is not as easy at is seems. The merging of these exposures can create some pretty wild effects more reminiscent of having a bad day in the 60’s rather than producing a fine photograph of a $1.6mil house in River Forest. Take a look at the “Hallway” shot and you see what I mean. But with some further processing and using Adobe’s Photoshop to get rid of the dust spots on my sensor (so need to get that thing cleaned) I then came up with this warm shot of the same hallway in a vintage condo in Oak Park. Now, HDR photography real does produce some amazing stuff. This photo below is a compilation or “merging” of a number of different exposures I took of a storm moving out over the Pacific off the shore of a beach in Playa Blanca, Panama. Not only did the merging capture the lights and darks but in processing I noticed the range of blue and grey from the water to sky was incredible. 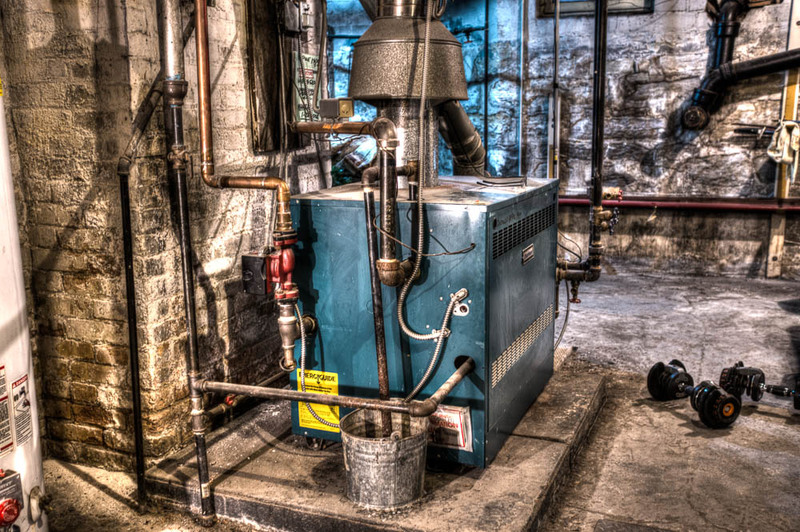 So how does HDR photography help us sell a house? Well, many of the professional real estate photography companies use HDR imaging when shooting high end or “luxury” properties. Some of these photographers use full-frame digital cameras (very high-end equipment) to take tens of photos of the same room from the same position at different exposure levels. Then, complicated imaging software creates a photo of the room that is so vivid and detailed it almost looks like you could touch the features in the photo. I am just now getting to the point where I can get the results I want from an HDR merging. Below is one of my most successful photos to date. The first shot is just the house how it looks when we take a “normal” digital photograph. Now take a look at what HDR can do for that same shot. Here, I let the NEX-7 do its own thing with the on-board HDR feature. But then I took another under-exposed shot to get at even deeper darks and shadows. Then I used a Lightroom add-on software to “merge” the two together. A little more post processing to get rid of the car in the driveway and there you go… not a bad shot. But what about you? Do you really need fancy cameras and HDR imaging software to achieve these same photos? What can you do with the digital camera you already have? German auto maker, Bayerische Motoren Werke AG (BMW to you and me), estimates that the average owner of one if its fine automobiles will only ever experience 60%-70% of the car’s full performance potential. Meaning, when you think you are pushing your BMW M5 hard into the apex of the highway off-ramp clover leaf you actually… are not. The car has the ability to be pushed even further and will still stick to the road like the Formula 1 or LeMans series racer where all that technology came from in the first place. Your digital camera is most likely the same. Do you know what it can really do? Have you gone online and really poured over the manual to see all its features and capabilities? You might be surprised at what it can really do.